We’re not going to lie, we’re ready for summer vibes and sun-soaked adventures and, of course, the bright, breezy, playful fashion that comes with it. From the hotel pool, to a sandy beach, to weekend exploring, here are four summer-savvy looks and the (pieces you need to pull them off!) to bring with you on your next warm weather vacation. For the insouciant weekend explorer, pack an easy A-line dress that falls away from your body. Dresses are the first thing we reach for when we travel. Why? They pack easily (ie: don’t take up a ton of space) and are a one-and-done option for getting dressed. Wear it with summer’s most sensible sandals—the stacked heel. Or, if you’re planning on getting in your steps—opt for sneakers instead. Whether your heading to a place where preppy perfection is embraced (or required) or simply heading out of town, a striped shirt is a must-have for your trip. At once a fashion crowd-pleaser that pairs with anything in your closet, it’s a seasonless staple made to be worn all year. Stripes are the one print that you can wear with anything. From mixing and matching with other playful patterns (think: polka dots) to pairing with denim of all sorts (especially white jeans) or even your favorite pair of summer shorts, this is the one piece you’ll always want on hand. If you love to show off a little leg, summertime is the perfect season to beat the heat with shorts. means beating the heat with shorts. From flowy, lightweight linen and cotton to knee-length bermudas, we love the effortless, easy going appeal of summer shorts. Pair any lightweight shorts with a breezy tank in a cool summer fabric like cotton or linen. Then, add your favorite summer sandals. Thank goodness for #tbt because denim skirts are definitely back! The perfect accompaniment to your summer vacation style, we will be bringing this with us to the beach, the big city and our last-minute weekend escapes. Take your pick! Denim skirts come in a plethora of lengths like mini, knee-length and even midi. 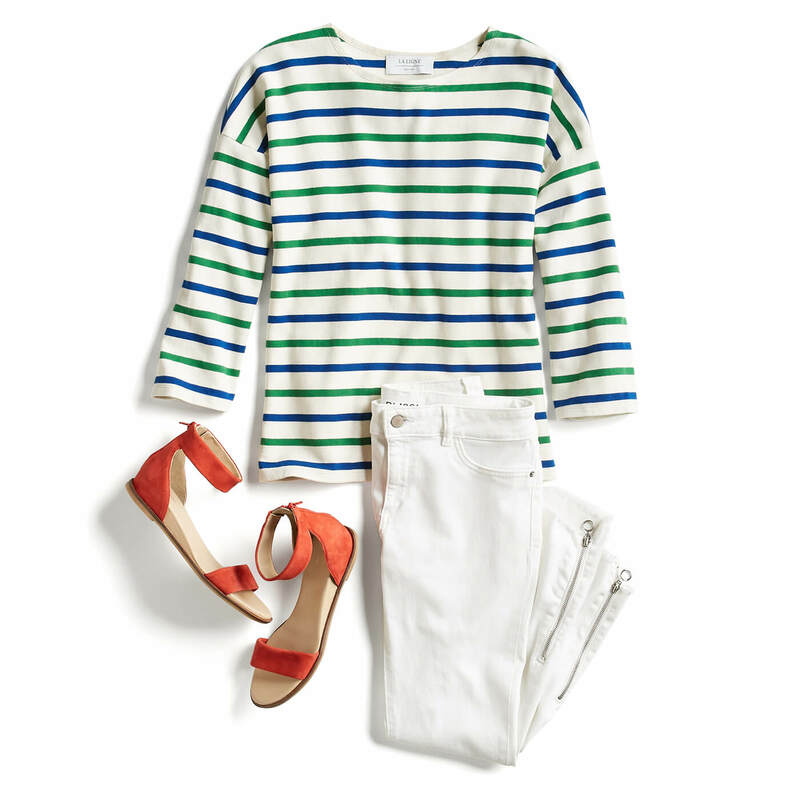 Pair it with a silk cami to dress up your look, or your favorite striped tee or tank for a casual day moment. What are you bringing on your next warm-weather vacation? Need help? Check out our low-maintenance checklist below! Need more packing advice? Visit our definitive guide to packing here!